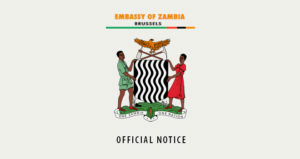 BRUSSELS, THURSDAY, 9th MARCH 2017 – Zambia’s Ambassador to the Benelux and Mission to the European Union (EU) Mrs Grace M. Mutale Kabwe has called on women to take up leading role in economic development. 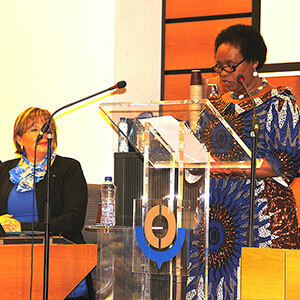 Ambassador Kabwe in her keynote address at World Customs Organisation (WCO) Head Quarters, Brussels, in commemoration of the International Women’s Day yesterday, commended the organisation’s proactive role in recognising women’s potential. She said this year’s theme, “Women in the Changing World of Work: Planet 50-50 by 2030” identifies impediments on women’s emancipation: at the same time challenges women to be strong by taking ground-breaking action that truly drives the greatest change. Ambassador Kabwe said it was unfortunate that women continue to be underrepresented in many sectors. She said in order to change the status quo, deliberate policies should be put in place aimed at maximising women’s economic potential coupled with specific mechanism to support women-led business. Ambassador Kabwe said she is happy about Zambia’s ratification of World Trade Organisation’s (WTO) Agreement on Trade Facilitation (ITF) – as it will positively impact on opportunities for women by granting small and medium sized enterprises (SMEs) easier access to international trade through simplification of Customs procedures. “When it comes to trade facilitation, women are empathetic and I know women in Customs have been facilitating trade especially the small scale cross border trade. The Ambassador expressed strong belief that modernising Customs procedures would allow more women to participate in formal labour market, and therefore contribute to gender equality, not only in the trade sector, but in many other key economic sectors. And WCO Deputy Secretary General, Mr. Sergio Mujica underscored the importance of gender equality in work places. He added, he is a firm believer that gender equality is not just a goal but a precondition for combating myriad challenges of the century, such as poverty, conflicts, as well as promoting sustainable development and good governance. He encouraged the Customs community to use existing tools at policy and organizational levels to further ensure workplace gender equality within Customs administrations. The WCO has over the years reiterated its commitment to remaining proactive in finding ways to raise awareness on the importance of achieving gender parity within the global Customs community, as well as contributing to its members’ efforts towards ensuring sustainable development.